Let’s do this the other way round for a change, and talk first about the wine. Or, to be specific, the sherry. I knew I was going to enjoy my evening the moment I clocked the list. Seven were listed, all available by the glass. I tried three, and I’ll be back for the others shortly because they were, like almost everything about this diminutive newcomer on High Bridge, life-affirmingly first-rate. I can’t for the life of me figure out why sherry has never gone full hipster, considering all the heritage and in-the-know geekery that could be derived from its unusual production style, and the potential for ironic points-scoring in drinking what my Aunty Diner used to keep locked away in her sideboard, to be brought out on high days and holidays only. The fact that it hasn’t joined obscure beer, artisan coffee and flannel shirts means that, happily for you and me, Jerez continues to produce some of the most affordable wines around for quality and complexity. The Urium Classic Palo Cortado and Faustino Gonzalez Oloroso are two absolutely banging examples, both exhibiting the deft interplay of sweet, salt, savoury and bitter flavours that can make sherry, to my mind, such a compelling choice. Aunty Diner’s Harvey’s Bristol Cream had nothing on these. 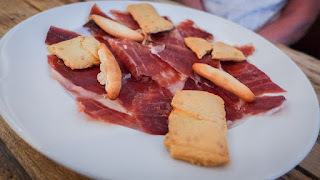 The Urium had a mouth-filling creaminess to it, while the Faustino, an “en rama” wine (which means minimally filtered, or more “natural”) had a racy dryness to it that was borderline addictive. Phwoar. Sherry make a fabulous accompaniment to food, which is all to the good, as the food at Kaltur is pretty fabulous too. 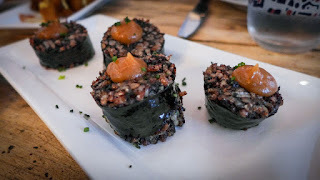 Newcastle has had “tapas” restaurants for ages, but most of these involve massive, unchanging menus of dull dishes hewn from base materials of dubious quality. Kaltur turns this proposition on its head. 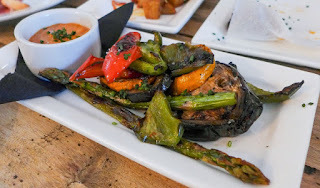 The company has made its reputation as an importer of quality Spanish produce, so their first restaurant has access to all the good stuff, from which they are offering a short, regularly changing menu. I wanted to order the lot. We tried a few litmus-test tapas staples to get the measure of the place. 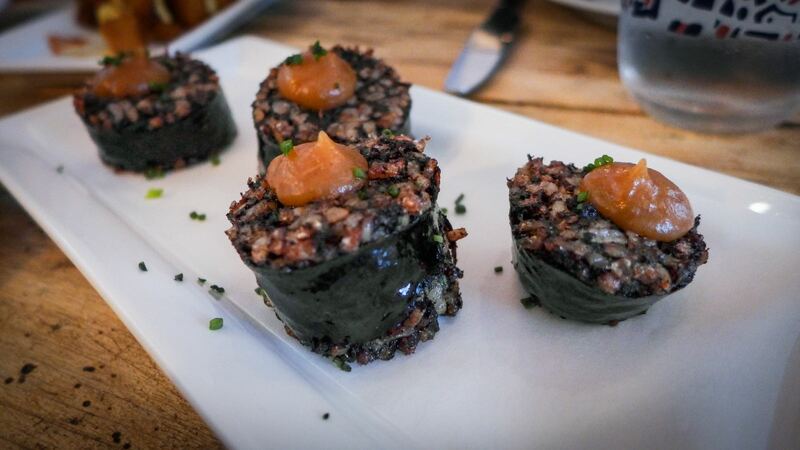 Morcilla - that’s black pudding bulked out with rice, rather than oatmeal - was ethereally light and delicately spiced and seasoned, each disc anointed by a mildly bracing blob of apple sauce. 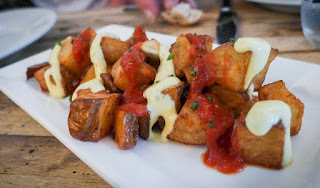 Patatas bravas were spot-on, with unusually flavoursome potato, a perfectly balanced tomato sauce and some reeking-with-garlic aioli. The latter was, presumably, made from the same grassy Kaltur-branded olive oil that we found on our table, and which we used to drench some very fine sourdough. Whole baby squid were crisp-yet-tender nuggets of ozoney delight. 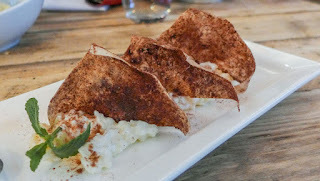 Their accompanying lime mayo was advisedly easy on the citrus. Grilled vegetables - peppers, asparagus, courgettes and aubergine - came with a Romesco sauce that was as nimble and well balanced as a toreador. 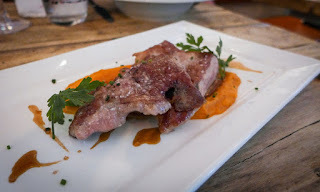 On the other hand, a plate of jamon Iberico from Guijuelo was merely nice. 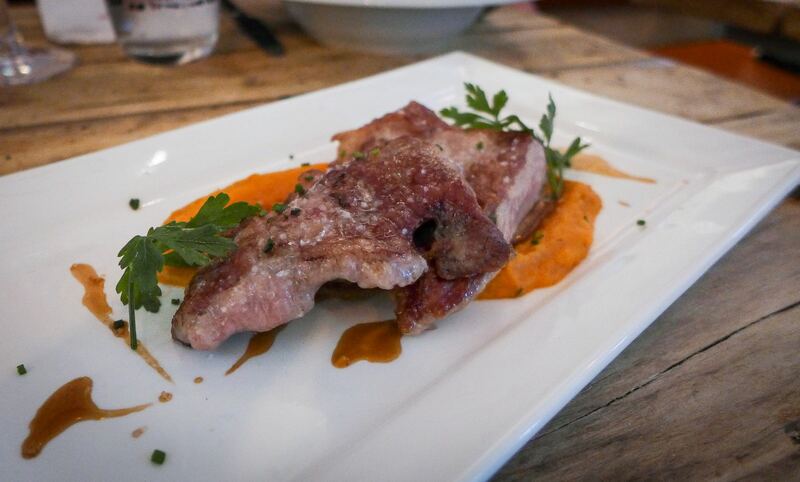 The fat melted delightfully on the tongue, but while the brick-red flesh looked the part, it just didn’t have the depth of flavour that you expect from serious pata negra. I wonder if - sacrilege! - this might have been carved ahead of service? 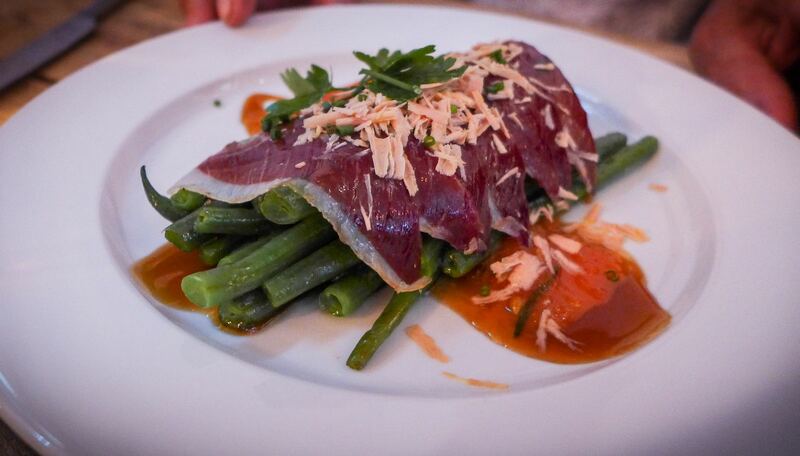 Main courses – they might want to call these “larger plates”, as they are certainly not the size of portion that the phrase “main course” means to some – were mostly very good. The one slight mis-fire was the most complex dish, a salad of green beans topped with duck ham and shavings of foie gras. 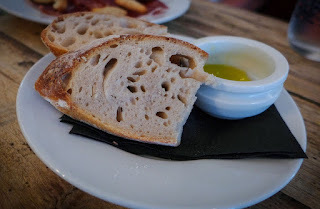 It was a little underseasoned, and had too much bean and too little foie – a bit like life. 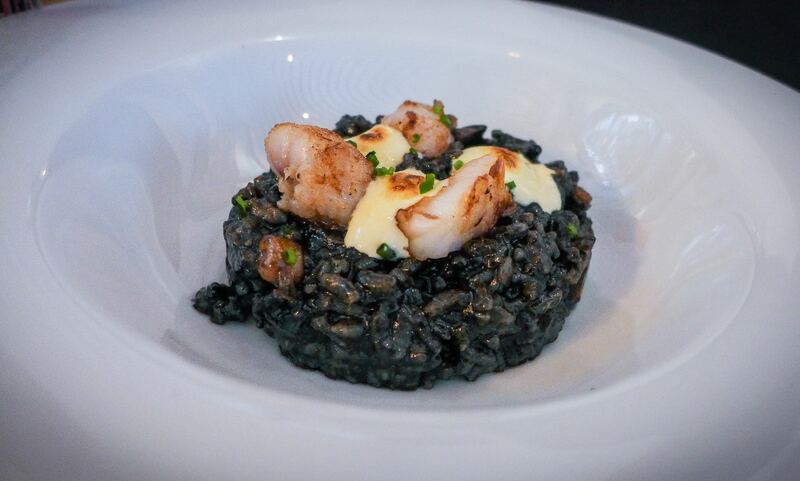 A dish of squid-ink blackened rice with monkfish was better, while my secreto iberico - a cut of acorn-infused pork I last ate at the stellar Man Behind The Curtain in Leeds - was terrific; correctly cooked to medium, aggressively seasoned, juicy, and dense with piggy flavour. There were three desserts on the menu. Unable to decide, I ordered them all. A light rice pudding, served cold, came with wafer-thin sails of some kind of pastry or biscuit, covered in cinnamon, the better for scooping up the calming sweet rice. 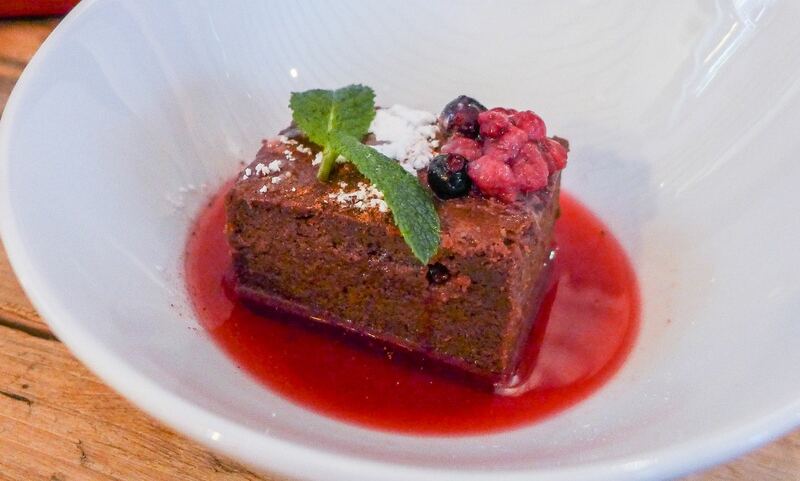 A dense cuboid of chocolate cake came swimming in a light but powerful sauce of red fruit and sherry. 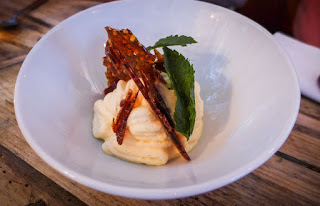 Best was a crema Catalana whose vanilla custardy richness had been lightened to a froth by being piped through an espuma gun, the resulting mousse crowned with a couple of shards of caramel. Simple but clever. An unusually light Pedro Ximénez, bursting with apricot and honey rather the usual sticky toffee pud in a glass, finished off our meal perfectly. Be sure to book. It’s only been open a couple of weeks, but word has already spread. The friendly and refreshingly knowledgeable front of house team had to apologetically turn away several disappointed diners during our short visit – there wasn’t a spare seat in the house. Our meal - with plenty of excellent wine and a tip - came to about £35 a head. 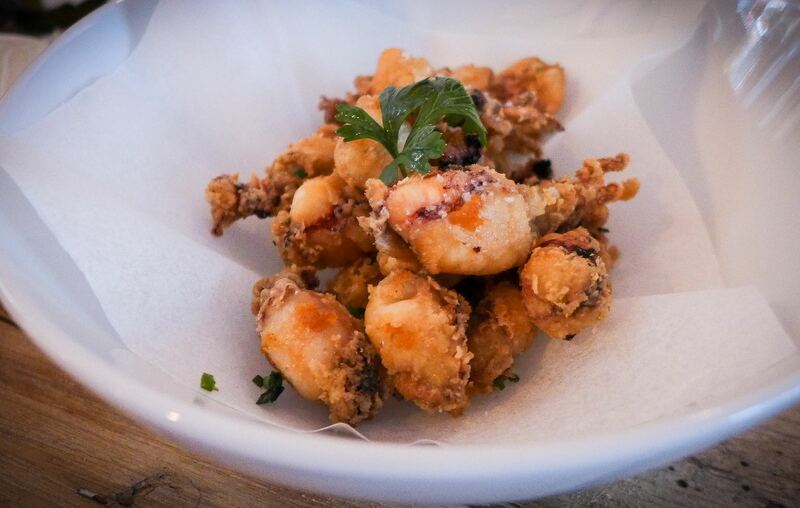 Newcastle has been crying out for a good tapas restaurant for ages and now, like the number 1 bus on Chillingham Road, two have come along at once. Tapas Revolution is by some distance the best of the bunch of new restaurants in Eldon Square’s Grey’s Quarter, but for me Kaltur edges it, if only for the drinks menu. 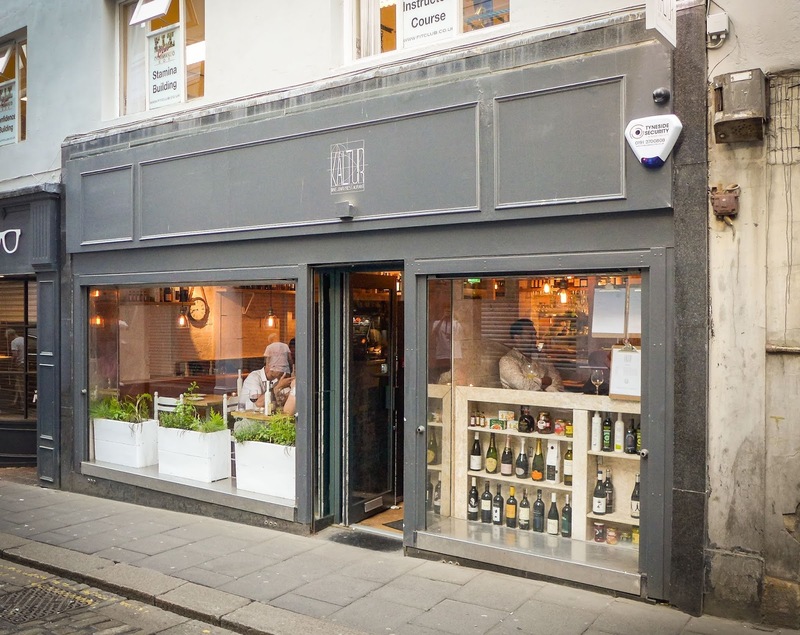 I’ve wanted a proper Newcastle sherry bar for ages and now it’s here: Hurrah! The fact that it’s also probably the best tapas restaurant in town just sweetens the deal further. ¡Salud! We went to Kaltur on Saturday night, for a return visit following a trip in April last year. We were a group of 6, ordered lots of food, and booked at 9:30 so got the last sitting and no pressure to vacate the table which definitely helps here. I thought if anything the food was better this time than previously. The only thing that didn't work for me was the goats cheese (which was just too pungent, possibly me being a wuss) and the deserts - a bland cheesecake and a decent almond torte. The rest was absolutely delicious, numerous highlights but the cod, prawn ravioli, corgette carpaccio, chorizo, patatas bravas, morcilla all memorable, along with excellent old vine Albarinho. Comparing this place to some of the other 2*s on your site seems harsh - this still felt much closer to a 4* to me. It did not feel uncared for in any way, hopefully your visit was a one-off bad day and you'll get to enjoy it again.